What matters the economics of a thing, when the faith of true believers is at stake? 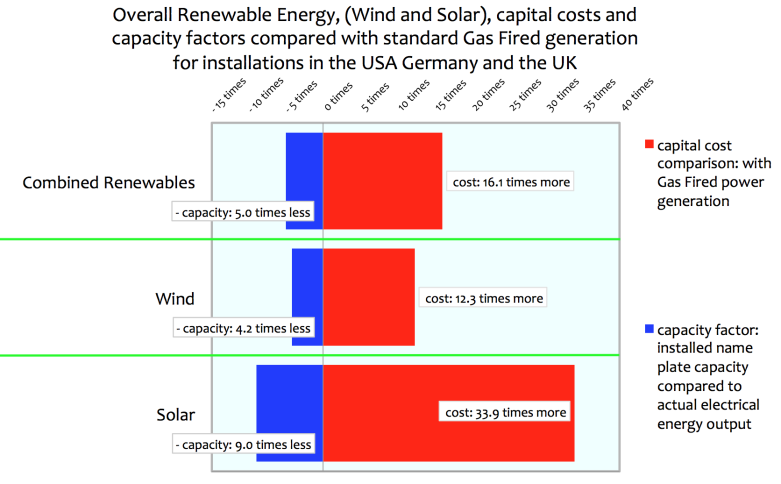 A comparison of both the Capital Cost and Energy Producing Effectiveness of the Renewable Energy investments of the USA, Germany and the UK. The summary diagram below collates the cost and capacity factors of Renewable Energy power sources compared to the cost and output capacity of conventional Gas Fired Electricity generation. In summary, these figures show that these three Western nations have spent of the order of at least ~$0.5trillion in capital costs alone, (conservatively estimated, only accounting for the primary capital costs ), to create Renewable Energy electrical generating capacity. Next Next post: Check Your Privilege!